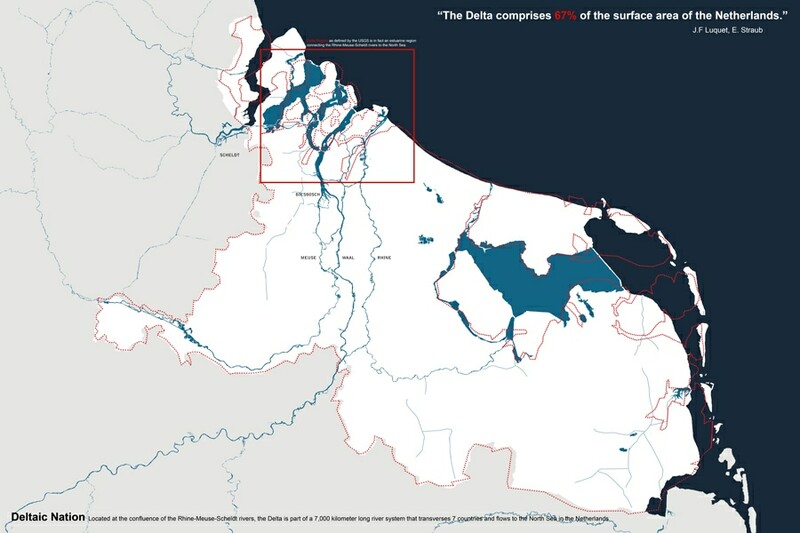 deDamming the Dutch Delta highlights how strategic adoption of hydrological dynamics can act as a major structuring foundation of urban form in the Dutch Delta region. 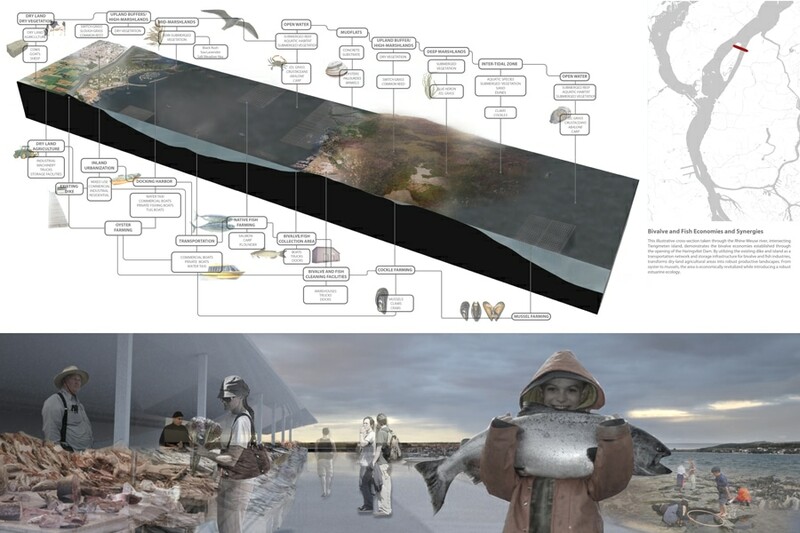 The proposal seeks to open the Haringvliet Dam (a dam built as one of the Delta Works projects) to introduce the exchange of salt and freshwater for the reclamation of estuarine ecologies. 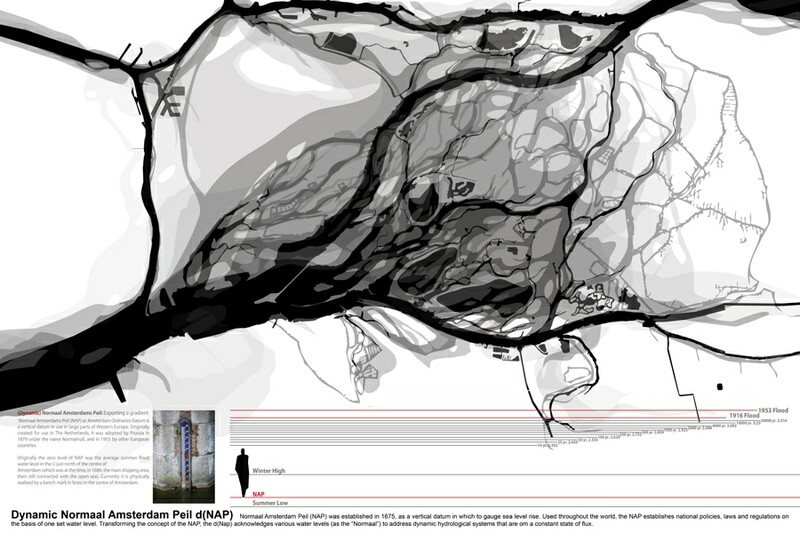 This project highlights how strategic adoption of hydrological dynamics can act as a major structuring foundation of urban form in the Dutch Delta region. 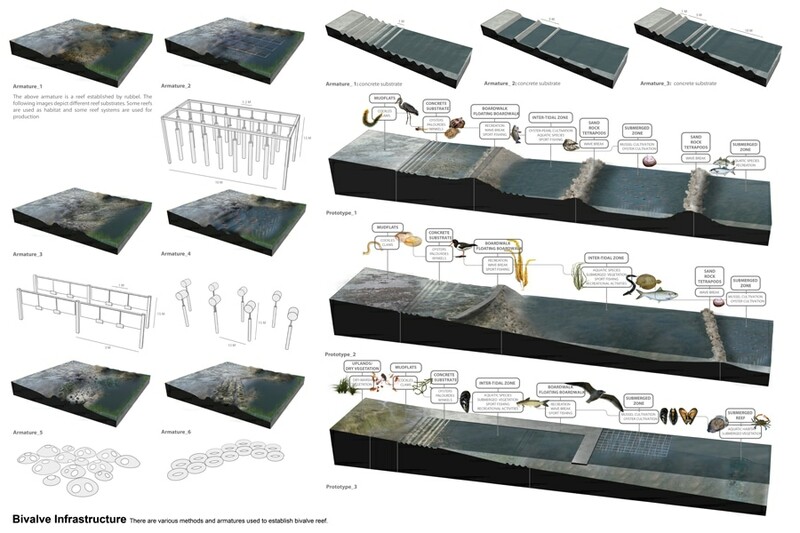 The project proposes to open the Haringvliet Dam (a dam built as one of the Delta Works projects) in order to introduce the exchange of salt and freshwater for the reclamation of estuarine ecologies. Together with tidal dynamics, silt and sedimentation the ground is transformed with the accretion of the estuary’s most vital resource: mud. The mud flats host thousands of bivalve species, one of the basic building blocks of intertidal ecologies. The benthic and pelagic food shed begin to thrive: plankton and bacteria, clams and crabs, smelt and salmon, beavers and seals, reeds and cattails, willows and poplars. It is a landscape where the dichotomies of wet and dry, sweet and salt dissolve, making room for an ecological gradient to emerge. Every living species co-exists, co-operates and co-develops across a range of hydrological zones, shoreline territories and intertidal time-scales. 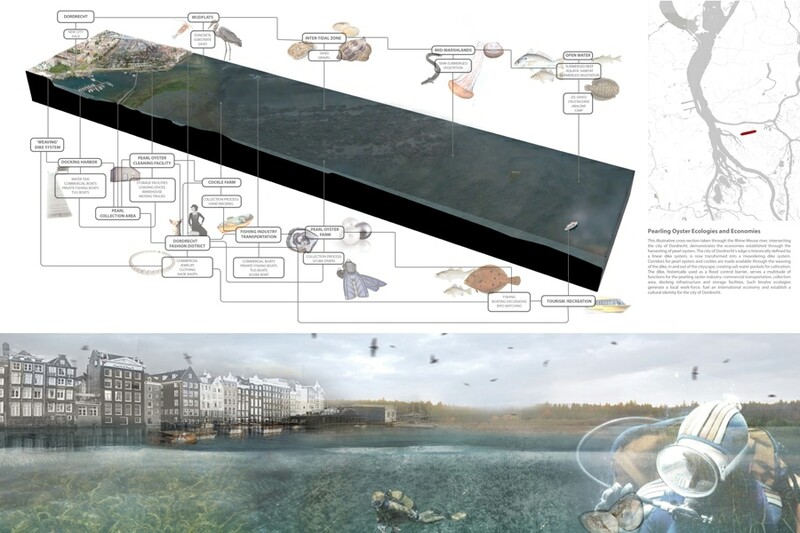 In the space of this geographic convergence and ecological systematization, a new aquatic habitat provides ground for proto-ecological processes to emerge and proto-urban conditions to spin-off. Closed, linear and engineered controls make way for the flexibility of soft systems. 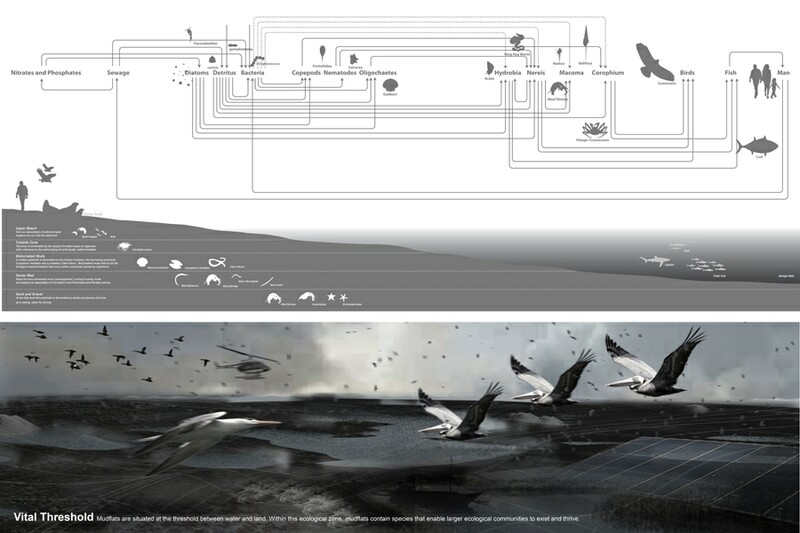 Ecology becomes infrastructural and the future of the city of Dordrecht becomes inseparable from the future of the estuary.